Another fun neighbor coming to Scott’s Addition! More than a year after a lease was signed for an old Scott’s Addition bingo hall, construction fences are up and workers are on the move at the latest addition to the neighborhood’s entertainment scene. 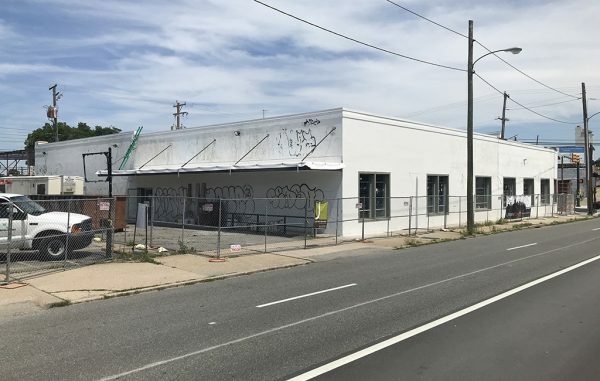 Crews are ramping up work on Bingo, which will combine a bar, arcade, restaurant and brewery under one roof at 2900 W. Broad St. on the southern border of Scott’s Addition. Bingo is a joint venture between Comfort and Pasture co-owners Jason Alley and Michele Jones, Saison owner Jay Bayer and local businessman Ted Ukrop. Bayer said this week they’re anticipating opening by September. The group had hoped to open the space by the first quarter this year, but the project slowed after city planners began targeting the area for denser development in anticipation of the bus rapid transit’s debut along the corridor. Last fall, the city rezoned much of the West Broad Street corridor through Scott’s Addition from light industrial use to B-7 mixed-use business, which allows for more density and laxer parking restrictions. Bayer said the group also was trying to configure the interior of the 11,900-square-foot venue, which will include 2,500 square feet of outdoor patio space. “The space is roughly being divided into thirds, with a little more space being dedicated to the brewery,” Bayer said. Richmond-based UrbanCore is the general contractor on the project. Hudson Century, led by Charles Bice of Richmond-based KB Building Service and Birck Turnbull of Cushman & Wakefield | Thalhimer, owns the building, having purchased it in February 2017 for $1.2 million, according to city records. In the meantime, Bayer said, work is underway to launch the brewery component with the unveiling of its flagship lager – Bingo – at the end of the month. Bingo has hired Ken Rayher, formerly of Champion Brewing Co. and Hardywood Park Craft Brewing, to oversee its brewing operations. Rayher will be responsible for expanding Bingo’s selection of brews, which Bayer said will include IPAs, saisons and lagers. Much of the equipment for Bingo’s 15-barrel system has been ordered and is soon to be installed in the building, he said. As the group works to finalize its menu, the partnership already has secured several classic games and pinball machines for the venue, including five ping-pong tables and several video and arcade games such as Mortal Kombat, Donkey Kong and Street Fighter.